THREE PEOPLE were rendered unconscious after enduring extreme suffocation in a near stampede at the Kumasi Central Market on Monday. The incident reportedly happened around 3:30 pm around the rush hours, according to an eyewitness. The victims, identified only as one male and two females, were rushed in an ambulance to the Komfo Anokye Teaching Hospital for treatment. DAILY GUIDE gathered they were among commuters and traders who were struggling and jostling one another for space and access to reach the Kejetia end of the market around the ’18 mu’ area of the Kumasi Central Market. It took the timely intervention of firefighters who gassed and watered the people who were suffocating due to congestion at the area. 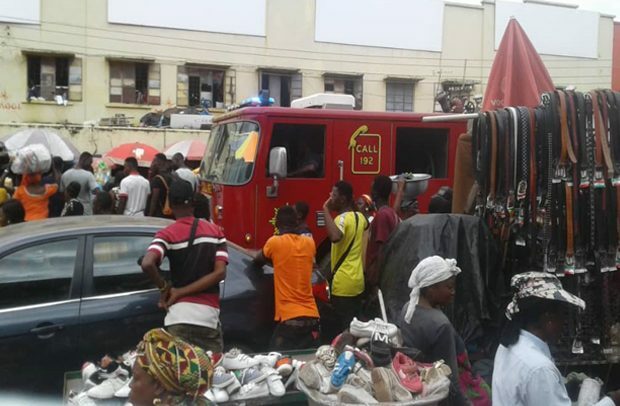 Firefighters were called in to end the people’s suffering, while the police were later brought to the scene to control the crowd, spokesman for the Kumasi Metropolitan Assembly, Godwin Kumah Nyame, who confirmed the incident to DAILY GUIDE, said. He dismissed wide speculation of the death of the victims. According to him, some of the traders had been asked to relocate their wares to enable more access routes to be created in the market as a stop-gap measure, whiles the city authorities find solutions to the human traffic and congestion at the market. Ongoing construction works at the Kejetia terminal has led to the choking of the Kumasi Central Market, with many of the access routes linking Dr Mensah portion, Alaba and other areas blocked by the contractors working on the project.